Sold by H2OINC and Fulfilled by Amazon. Gift-wrap available. ONLY THE PUREST & HIGHEST CONCENTRATED MAGNESIUM SOURCES: Pure and Natural. Premium quality! Made from Magnesium extracted from the Dead Sea. 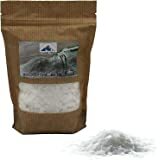 Sourced from the Ancient deep mineral deposits of the Dead Sea, this is highest concentration of Magnesium in bath salt. All Calming Aura products are organic, produced from the best raw materials. 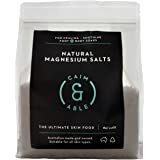 ORGANIC MAGNESIUM BATH FLAKE DETOXIFICATION: Magnesium Salt Flakes offer a highly effective, yet muscle calming, means of absorbing magnesium nutrients. Choose between the unmatched benefit of an immersive bathtub full body bath wash, or quicker convenient foot tub bath soak. Research has proven topical magnesium chloride to be a more effective administration method when matched with leading oral supplements. RAPIDLY ABSORBED THROUGH SKIN: Skin is the most efficient organ for detoxification, avoid the hassle of having to remember taking a supplement knowing its coming from the purest source. 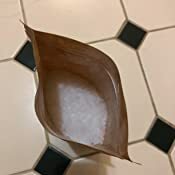 MAGNESIUM CHLORIDE FLAKES VS EPSOM SALT: Although both salts are absorbed better then Oral Magnesium Supplements, magnesium chloride flakes have a different molecular structure which is better absorbed into the body then Epsom salt. Magnesium Chloride is often offered to those with severe Magnesium deficiencies. 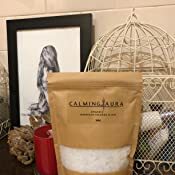 BATH TO MAKE A CHANGE: completely toxin and heavy metal free Calming Aura Magnesium helps ease symptoms like Restless Legs, muscle recovery, improving circulation, headaches, joint pain, restless leg syndrome, cramps, and is a more sensitive application than other transdermal techniques. 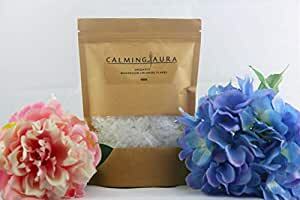 Calming Aura magnesium bath flakes are designed for convenient and optimal absorption of magnesium topically. Bypass oral consumption and the unpleasant laxative side effects. Use a Natural approach, Dating back centuries, the Greeks and Romans would bathe in mineral-rich hot springs to treat a variety of ailments. Bathe in mineral-rich warm baths to treat a variety of ailments such as detoxification, stress relief, muscle aches and pains, eczema, increased circulation. Great for kids with allergies and sensitive skin! BUY TODAY! WARNING: FOR EXTERNAL USE ONLY. DO NOT APPLY TO BROKEN OR IRRITATED SKIN. AVOID CONTACT WITH EYES. IF CONTACT WITH EYES OCCUR, RINSE IMMEDIATELY WITH CLEAN WATER. IF A RASH OR IRRITATION DEVELOPS, DISCONTINUE USE AND SEEK MEDICAL ATTENTION. BAG MAY BE A CHOKING HAZARD, KEEP AWAY FROM CHILDREN.